One of the things that I really enjoy about flying is the feeling that I am being looked after and catered for. And sure, to ensure you are catered for as best as possible, you have to pay more for this feeling. And some will tell you that it’s not worth the money. Flying at the pointy end of the plane is the most expensive real estate on the planet. This a question I know a lot of people would be asking. After all, the back of the plane and the front of the plane both arrive at the destination at pretty well the exact same time….so there’s no expediation factor involved here. And when you consider the price paid in terms of dollars per minute, well, really? Why not travel coach and then just refresh yourself at your destination with an extra day of hotel accommodation and a massage or two, and still come out several thousand dollars ahead? Doesn’t that make a truckload more sense? You could invest all that extra money that you save [on the price of each flight!!!] and turn it into a small fortune and leave it as an inheritance to your children… after all, they deserve it more than you deserve the pleasure of travelling up the front of the plane…. don’t they? I’ve just this last week celebrated my fifty-eighth birthday. I know it’s not many. I have a long way to go to catch up to the Queen or Prince Philip. But the scary thing is that fifty-eight is very close to sixty. One of my very dear friends died of a renal tumor at age sixty. Another of my dear friends died from a brain tumour at age sixty-four. And another golf friend of mine was dead from cancer in his mid-fifties. There’s no point waiting until some-day…. A tap on the shoulder is never expected. Sadly, most dentists, in fact most everybody, gets to age sixty-five and haven’t put away enough money to retire comfortably. Only a small percentage of the population ever save enough for their retirement. What do they blow their money on? I think there is a simple answer. I believe that nobody out there really plans. All they ever do and try to do is to get by. Why on earth would you not start now and plan for your retirement? Why would you work at all without an end goal or purpose? You need to have a plan. Even if it is something as simple as “The Richest Man In Babylon” principle. Put part of what you earn today away for another day. Don’t squander all that you earn today on just getting by today. But in planning for that “another day” you should also plan to enjoy the journey along the way. Put money away now for that time when you want to enjoy it. The simple matter of compound interest will make this a very attractive proposition. You’ve studied hard, you’ve taken risks in buying your own dental office…why shouldn’t you be rewarded for doing so? But why should you penalise yourself to the back of the plane along the way? Plan to smell the roses along the way. Don’t be miserable getting to your destination of comfortable retirement. But don’t waste it along the way. Plan to retire well. But plan to live well as well. Because you do spend a long time dead…. You really do need to grab a hold of your own destiny. Otherwise someone else is going to have plans for you that you may not want to be a part of…. Last week I played a round of early morning golf with my friend Gerry at his golf club. Although I could have played a lot better, it was great to see Gerry and spend some time with him, as we haven’t played golf together for a few years. And being the exceptional host, Gerry paid for my game for the day, which was really nice. On my way home, I was feeling a little peckish so I decided to drop in to a local Sushi restaurant on my way home for a late bite of lunch. As it was after lunchtime, the restaurant was not busy because most diners would have returned to work. I ate a few plates from the “train” and read my emails on my phone. I noticed that a couple of people along from me, that a young dad had arrived with his young son. The son sat up at the counter, but the dad sat beside the counter at one of the lower tables. As I rose to leave, I noticed the dad was dining with a young girl, wearing headphones, and sitting in a wheelchair. As I passed them by, the girl, who had issues of her own, was enjoying some McDonalds French Fries on her tray. When I paid at the counter for my lunch, I asked the lady working there to take an extra $50.00 on my Visa card and to put it towards the meal that this young dad was having. She said he probably wasn’t eating $50.00 worth of Sushi, but that didn’t bother me. I just wanted to let this guy know that I felt for him. I hope it brightened his day….. If it’s not written down in the notes it never happened. Even if it did happen, even if it was said and agreed upon, the written note is more powerful than the spoken word. When I write up the arrangements for my coaching agreements with my clients, it is all there in black and white. Sometimes potential clients baulk at the paperwork. Chances are those who falter at the starting line will more likely falter along the journey. Best to find out sooner rather than later. And yet I hear in business about arrangements with no paperwork. And these arrangements are fraught with disaster. Humans by nature are deceiptful. If they were not, then the ten commandments could have been a lot shorter and written on one tablet instead of two. In any business relationship and arrangement there will always be one party trying to get an upper hand, and there will always be one party who feels that the other person has had a bigger “win” in the relationship, even if both parties have had a win. Even in employment, there are well paid employees who feel that maybe they should share in the business profits, yet have no financial risk investment in the business….is that an entirely fair expectation? That’s kind of like asking for a share of the lottery win when you haven’t actually helped buy the winning ticket…. Recently I heard about two failed arrangements in dentistry where there was no agreement in writing in both cases. The first arrangement was in a startup dental office where, when things became financially tighter, the partners had no written agreement on the contributions to the partnership in terms of both money and time, as well as no written arrangements about the remunerations for the partners for their exertions. Sadly, this “partnership” ended with one partner walking away with very little. The second arrangement involved a dentist who purchased a dental office from a retiring dentist. At this office a third dentist had been employed, and this third dentist stayed on under the new owner. Sadly, the dentist vendor did not have a written agreement with the employed dentist and so the dentist purchaser continued this arrangement. Winding the clock forward and the employed dentist leaves the dental practice and goes to work elsewhere, notifying the patients that he treated at the practice, as well as altering the contact details in the computer records for those patients. The purchasing dentist had no case because there was no employment agreement in writing. Finally, in closing, an agreement in writing must be lawful. The agreement cannot override the laws of the land. If bigamy is agreed upon in an agreement, it is not a binding contract if bigamy is outlawed in that country. The same goes for slavery. And the same goes for an agreement calling someone a “contractor” when they are an employee. Good money spent on legal fees regarding contracts is a sound investment. Do not scrimp in your attention to detail…. Be There Or Get Out. I ate lunch today with my wife at a local eatery. It’s one of those coffee shop, breakfast, lunch, drop in style places that pop up everywhere, and has been around near our home for a few years. We ate lunch there while we had one of our cars in for its annual registration inspection. It passed. Are you there for your business or are you there for yourself? And it’s because that was the feeling I was getting in this restaurant. Today, I was watching a news clip online about a young very talented rugby league player, and the comment about him that stuck in my head was that he was showing, by his onfield actions, that he wasn’t only there for himself, but was willing to put his body on the line for the team. So back to the restaurant…. I guess if you’re going to play music or background music in a restaurant, it would really make good sense to make sure that the music was playing uninterrupted and not being played with periods of poor reception. Or, well, that’s how it sounded to me. It sounded as though I was hearing a radio broadcast drifting in and out of reception for some reason. The music being played was good. It’s just that it was broken up to be a consistently poor listening experience. Secondly, one of the big *RULES* of dining and dining service is to never remove plates from a table until all diners at that table have finished eating. Suffice to say, although well intended, the removal of the plate of one diner ahead of the other diner’s only serves to highlight the lack of etiquette education being taught to the wait staff. Finally, when it came time to settle the account for the meal, I needed to approach the counter to do so. Because I can see that myself on the terminal…. A long time ago a friend of mine told me of a romantic event he had in the back of a car where his partner had been doodling in the mist on the back window…. When you’re going to be there, then be there or go home. In this dining experience today, the girl at the front on the register could have shown some form of interest in her customer. The reason customers [and patients] do not return to a business is because they feel as if they are being taken for granted. Fix your music. And fix your systems and protocols. And several little things ignored do add up cumulatively. Don’t let your attentions to details shoot you in the foot. What could you be doing better in your [dental] business, in small increments at multiple touch points for your visitors that would make their visit more memorable for them? I bet you could find plenty of little things to do better…. Yet some dentists try to. They try to do everything in their dental practice. Some do ordering and stock control. Some do sundry supplies at supermarkets. Back at the office they do the marketing. They talk to all of the marketing reps from Google, PPC firms, SEO firms, and the like. Why would someone who drills teeth all day for a living be doing all these extra menial tasks as well? Why not simply let someone else do these duties? Why overload yourself with all of these other time consuming tasks when you could be, and need to be unwinding and resting and relaxing? Why not pay someone else to do these other things? Those you pay will be more specialised, they will be more enthusiastic, and they will be less expensive. 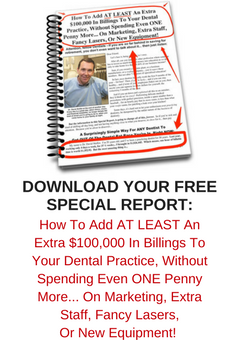 Why would a dentist working on a $400.00 per hour hourly rate spend time doing something that he could pay someone better qualified to do at an hourly rate of $30.00 per hour? It just doesn’t make any sense to be operating in any other manner? Even within the dental office I see dentists mixing plaster, I see dentists mixing alginate, I see dentists performing a whole range of clinical and clerical duties while people better qualified to do those duties stand and watch. On lower hourly rates. This just doesn’t make any sense at all, does it? What he meant was that you should always do what is the best use of your time and then delegate those activities that you are able to delegate. And sometimes the best use of your time is resting and relaxation. Sure doing some things yourself can save you the expense of paying someone else to do those tasks. But what I’ve found is that when I pay someone else to look after duties such as these, those people tend to do a much better job in a lot less time. For your own sanity, you need to delegate. By all means drill teeth, and supervise and manage your investment in your business. But avoid micro-managing yourself into an early grave. Life is very difficult being a one-man-band….